This is not a LOCAL story, but is an interesting one just the same. Ever wonder if TV or Movie Stars use their popularity and bank accounts to help those in need? Many do. The one I will mention today is really COOL! Aaaaaay! Henry Winkler – AKA “the fonz” is a huge supporter of charitable causes… notably, raising awareness for a fairly unknown disease that afflicted his own mother – Upper Limb Spasticity. Today’s Caregiver magazine and Caregiver.com, the nation’s foremost print magazine and Web community educating, training and supporting family and professional caregivers since 1995, will present the Robert M. Barg Memorial Achievement Award to actor, director, author and producer, Henry Winkler during the May 24th Western Connecticut Fearless Caregiver Conference in Southbury, Connecticut. “This prestigious award has only been presented to a select few caregiver advocates in the organization’s 17 year history who represent a special brand of kindness and advocacy and whose hard work truly makes a difference in the lives of those in need,” said Gary Barg, founder and editor-in-chief of the first national magazine for caregivers, Today’s Caregiver magazine, Caregiver.com, and the Fearless Caregiver Conferences. Prior recipients of the Robert M. Barg Memorial Achievement Award include Debbie Reynolds, Clay Aiken, Della Reese, Robert Urich, Leeza Gibbons, Clay Walker, Patricia Richardson and Linda Dano. 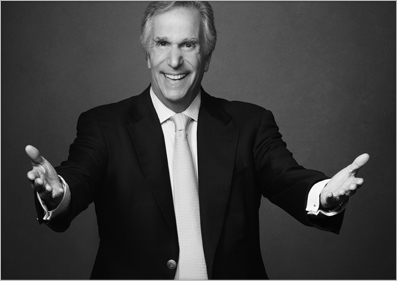 Legendary “Happy Days” star Henry Winkler is the ambassador for the “Open Arms: Raising Awareness of Upper Limb Spasticity” educational campaign which aims to reach those who are impacted by upper limb spasticity and don’t know where to turn for help. Winkler is personally familiar with the impact that upper limb spasticity can have on a person. His late mother struggled with the condition, without treatment, for 10 years following a stroke before she passed away. To many of you reading this, my mother’s experience with upper limb spasticity will be sadly familiar. I had always known my mother to be a busy bee, full of life and a force of nature – that’s who she was. Even in her later years, my mother kept very active – whether it was her regular card games with friends, organizing and participating in events at her synagogue or just even driving around town, doing her daily errands, she was always on the move. However, things pretty much ground to a halt after she began to experience upper limb spasticity after she had a stroke. Her arm became tight, involuntarily stuck close to her body, which severely limited her ability to get around on her own. Soon her upper limb spasticity became so problematic that my sister and I, as well as her other caregivers, had to help her with the simplest of tasks – tying her shoes, helping her get dressed and eating. My mother struggled with upper limb spasticity for 10 long years before she passed. Unfortunately, there was so much less known about upper limb spasticity back then. Today, not only do we have a better understanding of upper limb spasticity, we also know more on how to manage the condition. Sadly, there continues to be low awareness and under-diagnosis of the condition. The problem is that upper limb spasticity can come on months, and sometimes even years after the original injury – sometimes after patients are out of the hospital and are no longer seeing specialists, like neurologists or physiatrists, who see the condition on a regular basis and are specifically trained to manage and treat it. That’s why I chose to become an Ambassador of the “Open Arms” educational campaign. I’ve joined forces with this incredible team of national patient advocacy groups and Allergan, the maker of BOTOX® (onabotulinumtoxinA), to raise awareness for upper limb spasticity and let people know that upper limb spasticity treatment options are available. Seeing what my mother went through, I feel I owe it to others with the condition to do what I can to help.